When my car was delivered in november 2013, I knew I had an early European production model. The US version was already in production for over a year. But I was aware that there might be issues coming. I was always helped at Tesla Service Center Brussels. No matter what the issue was, they always treated my as a king. Battery issues: Quite soon after delivery my car throwed some error messages. I couldn’t reproduce the error message and the car never stalled, so it didn’t seem to be a big problem to me. Untill in january 2015, my car failed to charge. And a couple of days later he even failed to start. He was towed from my driveway for what was analysed as a battery insulation problem. They refurbished my battery in the coming months and bolted a loaner battery under my car. Later I got my original battery back. Since then no more unexplainable error messages. TPMS sensors : better known as Tire Pressure Monitor System sensors. The car sometimes didn’t find the sensors in the wheels, causing an error message on the dash. This problem one took some time to analyse, because it was hard to reproduce. The problem mostly occured on rainy days. They replaced some antenna on the car and the problem was fixed. Battery heather : Spring 2015, when my refurbished battery was mounted back in, I had a faulty battery heather. Not that I noticed something, but they read in the logs of the car. The thing was replaced under warrantee. Except for having to wait for an extra hour, it wasn’t a big deal. On the contrary, the whole crew worked overtime on a Friday evening to get it replaced. Really top team!! Screen issue : My big center screen was acting strange. It was reacting on input that was never given. So suddenly my map would start to zoom in, without me touching the zoom button. Being hard to reproduce, the Tesla crew searched for 2 days finding the root cause of the issue. It was caused by a faulty controller. The service center had to replace the entire central screen and ICU. My car had >80.000km at that time, but neverthless they replaced it in warrantee. I’m very happy with the Tesla Service Team, they really wanted to dig deep in the problem and find the real root cause. They could have replaced the screen from day 1 and check if the problem persisted. Along the screen issue I also had other little issues that were some partially, some entirely replaced in warrantee. Those were issues like, wind coming through left front window (fix triangle in the front) -> which they sealed off. Opening the trunk made some squeezes -> They cleaned out the pump. Minor issues, but since I had to open a warranty case, I insisted of putting them in. And they discovered a faulty cabin heather, which they immediatly replaced. This was the first and only time I had to pay for a repair. And the amount was < 100€. 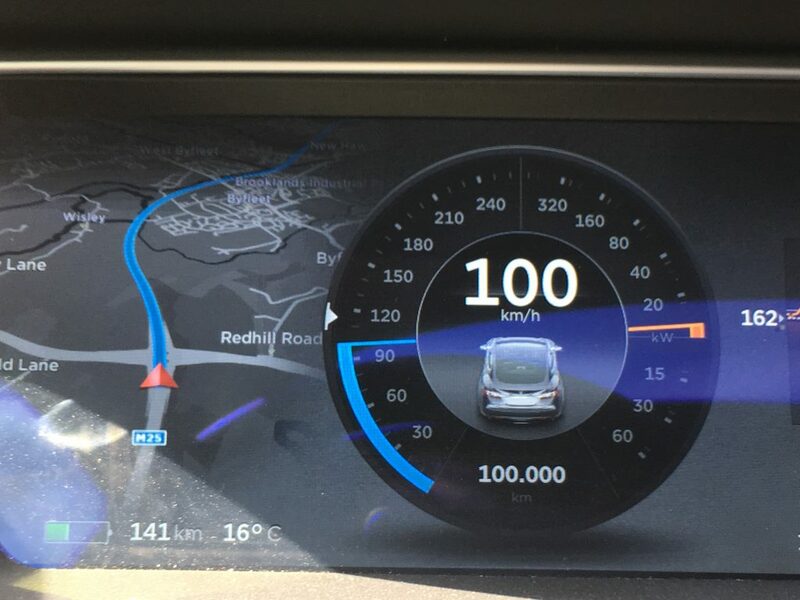 In my opinion everyone driving < 200km per day should have no issues transitioning to a Model S in terms of daily range. Allthough with prices going up, it's getting less and less affordable. But maybe a second hand vehicle could be a good alternative. Or a Model 3 in the near future. Don’t get fooled by the 500km rated range. You’ll only get it driving 60km/h and no sporty acceleration. If you drive at normal highway speeds, 300 km is reasonable when fully charged. If you have a heavy right foot, you might strand at 250km. And rain, cold weather are all factors that give the car less range. Be aware of that making trips. After 100.000 km, I still have a typical charge of 374km at 100% SoC (State of Charge), which is 94% of it’s original capacity. A note to this number is that I can’t tell for sure that the 374 is calculated in the same way as the 400 was calculated 2,5 years ago. I’ve had multiple software updates of which some might have impacted the range calculation. Last months, my daily range increased from 271 km to 281 km at a 75% SoC. This after a trip to Geneva, when I did a 100%-2% trip to Paris. I started with 100% charge and ended in Senlis with only 2% left in my battery. This might have given vital info to the formulas calculating the range.